Planning a new blog post on getting things done, based on a little facebook research I did recently…I figure if there are strategies that are shared by freelance techies; writers with full-time day jobs; perpetually curious students; professors with serious media addictions; and moms with multiple jobs, both paid and creative — well, then, perhaps they are useful strategies. Worth a shot. Wondering if it is going to snow about an inch every day for the next two months like it has for the last week or so. I am weary of the overcast. Uh, oh, I have to go. 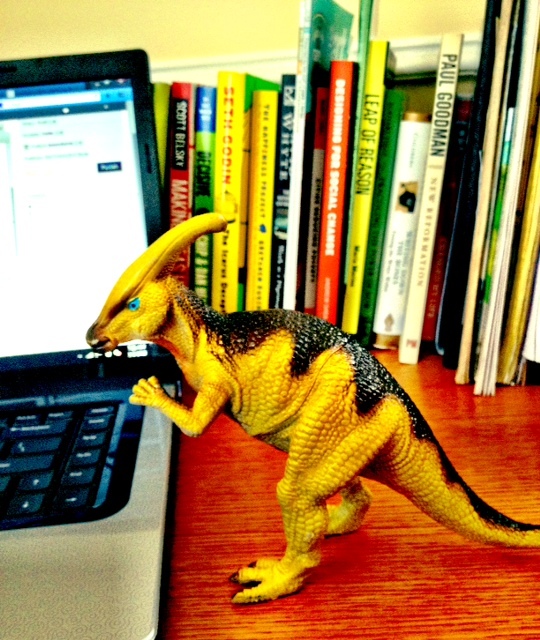 I’m under assault by a parasaurolophus. Right here on my desk. It roars. This entry was posted in Baking/Cooking, Hoping, Living, Parenting, Working and tagged planning, strategy, time management, work.